This is the third post about Itoh peonies in the past week or so and this is the one I have been most excited about. I have wanted to gaze, adoringly, into the face of ‘Bartzella’ for years and this plant has been in the garden here for two years and now the waiting is over: the plant has a dozen or so buds and the first are just about open. It is amazing to think that a plant will cost you about €45 and yet, 15 years ago, the first specimens sold for $1000. 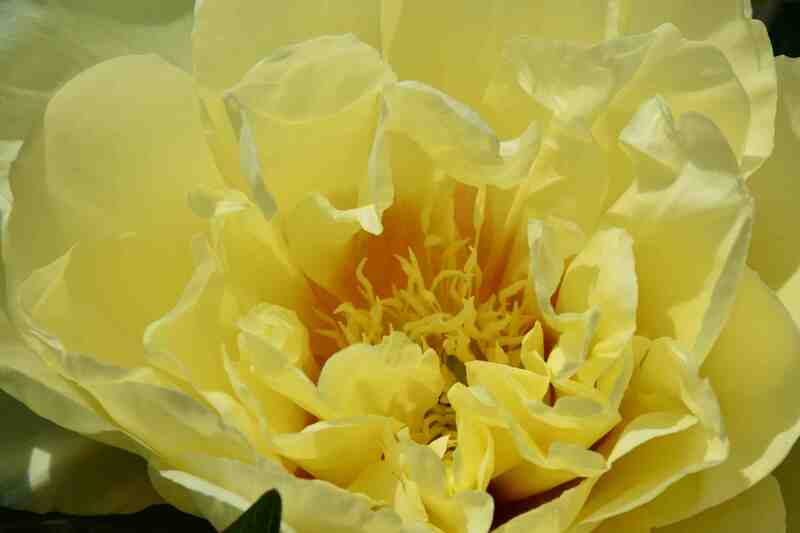 ‘Bartzella’ is probably the best known and definitely the most affordable Itoh peony and it may be the best. I only have six here (yes, more to come) so I can hardly make definitive comparisons, but this is a good plant. It will grow to about 90cm high and across but this one is just 70cm high at the moment and stems have just one bud in most cases. The foliage is deep green and jagged and looks good without flowers but those blooms are really special. They are delicious, sherbert lemon yellow – by the way the yellow colour is not relevant to the name: it is not named after that famous yellow character! The flowers are more or less fully double and stained red in the centre. As the flowers age they fade a little, especially the outer petals. And they are big: easily 15cm across and almost 20cm. 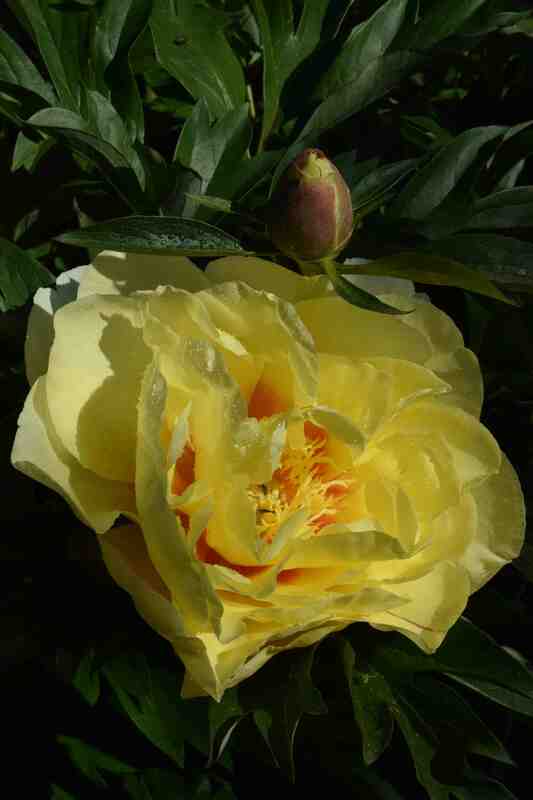 They change character as the open and look like yellow shrub roses in bud but then open fully into big, gorgeous ‘look at me’ peonies. And they are scented too. 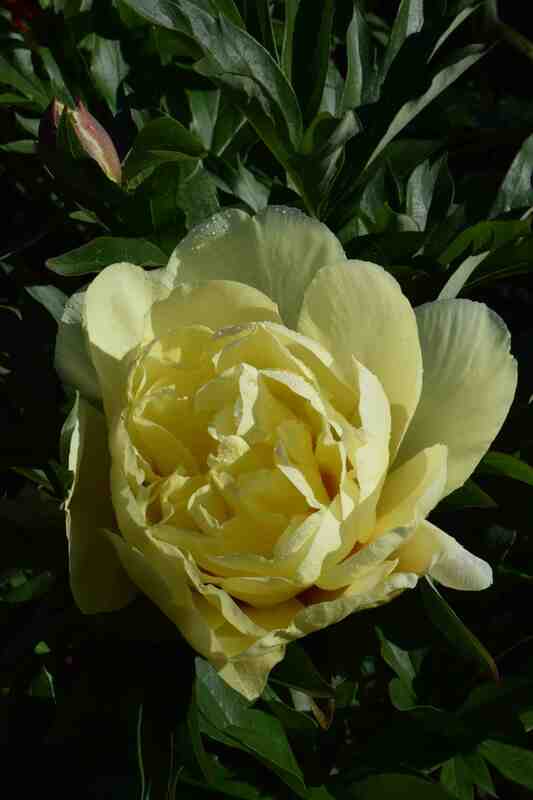 Like all Itoh peonies, the stems are self supporting and the blooms last way longer than tree peonies. They also make good cut flowers, though I have not tried that yet – maybe I will cut the one. Like my other Itohs I bought mine from Leamore nurseries near Ashwood, Wicklow but ‘Bartzella’ is even available in garden centres. 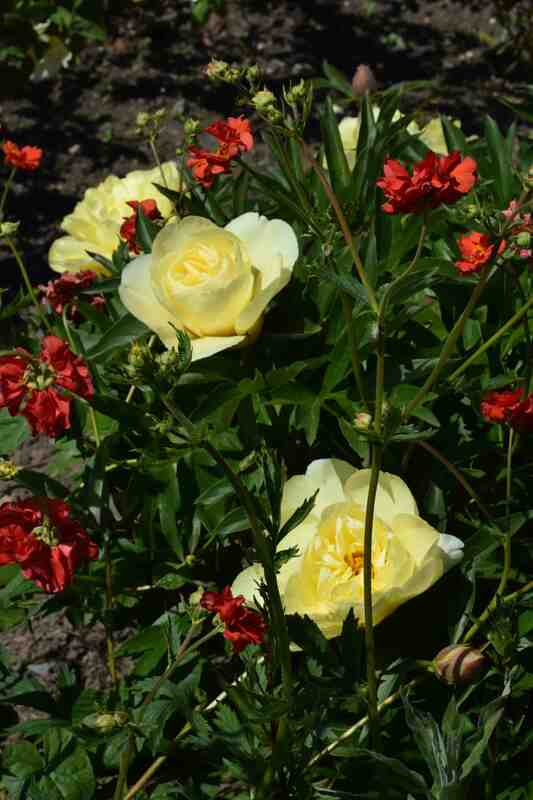 It is easy to grow, flowers like crazy, lives for years and doesn’t even need staking. You got some nice images too. We don’t have Peonies here at all. I’m glad you found the one you liked. I know, it’s so funny that in the U.S., most every one is crazy over flowers that don’t grow here. If I were to plant a rose bush here, I would have to do research as to which kind is hardy in the tropics, or have a sprinkler on all day, and learn all the pests that attack it! I have seen rose bushes here, but the need care in this weather. I think some of the china or tea roses may do ok there – I think there are a lot that used to be grown in Bermuda – i need to check up on what ones. But yes we all want what we can’t grow! when someone asks what I would like …….I will know now and love that yellow just like sunny …. hows he doing? A 10? must be so good. Will keep an eye out for one.